A charity rescue boat carrying 47 migrants docked in Sicily on Thursday after being stranded in the Mediterranean for two weeks, as European Union member states haggled over who should take them in. The Sea-Watch 3 ship run by the Sea-Watch NGO docked in Catania, in eastern Sicily on Thursday morning. "We're happy for our guests whose ordeal is now over and we wish them all the best," the NGO said on Twitter. "May Europe grant them a warm welcome and let them live their lifes (sic) as the survivors they are," it added. However, Sea-Watch International denounced the Italian government's decision to have the ship dock in Catania instead of Syracuse, around 70km south. The country's government — led by a coalition between the anti-establishment Five Star Movement and the anti-immigration League Party — has repeatedly denied rescue ships the right to dock in Italy, upping the pressure on other member states to take in a greater number of migrants. Interior Minister Matteo Salvini has also called for an investigation of the Dutch-flagged, German-run Sea-Watch NGO, accusing it of creating a pull factor for migrants and thus encouraging illegal migration. 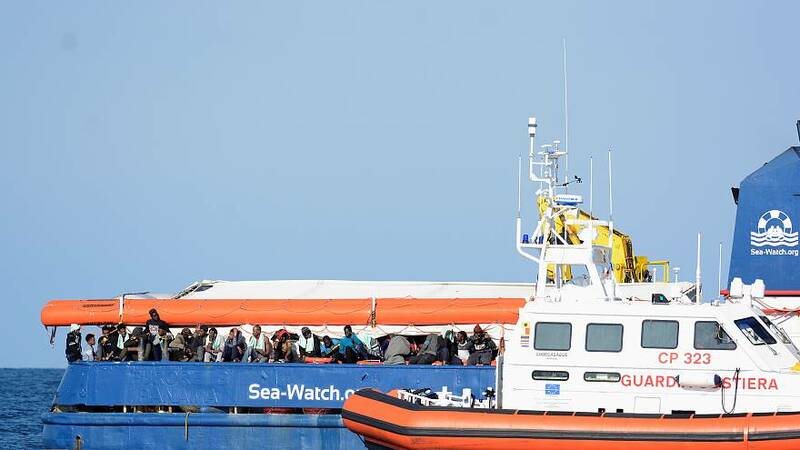 For Sea-Watch, the decision to disembark in Catania amounts to a "political move." "That means we are moving away from a port of safety, towards a port where there is a prosecutor, known for his agenda regarding sea rescue NGOs. "We hope for the best and expect the worst," it added on Twitter. Meanwhile, Salvini described the deal struck earlier this week between Italy and six other member states to take in the migrants as a "triumph", according to the ANSA news agency. The 47 migrants rescued off the coast of Libya 12 days ago will be distributed between France, Germany, Italy, Luxembourg, Malta, Portugal and Romania. "Mission accomplished! Once again thanks to the work of the Interior Ministry, Europe has been forced to intervene and assume its responsibilities," ANSA quoted Salvini as saying on Wednesday. The Netherlands, which Italy had called upon to take in some of the migrants, refused to do so on Monday with the Justice and Security Ministry saying in a statement that an agreement to distinguish refugees from economic migrants was needed. "Those who are not entitled to international protection need to be sent back immediately on arrival at European borders," it said. "Without a clear perspective for such a structural solution, the Netherlands will not participate in ad hoc measures for the disembarkation," it went on.